Initiation of tumor angiogenesis up-regulates PSF1 promoter activity in endothelial cells (ECs). A: Skin vasculature 3 days after B16 melanoma cell injection into the mouse. White dashed line indicates localization of tumor. Arrows indicate EGFP-positive ECs around the tumor. Two pieces of images were put together and edited to one piece. B: Sprouting new capillary from preexisting blood vessels around the tumor. White dashed line indicates localization of tumor. Arrows indicate budding ECs that express EGFP and CD31 (red). C: Flow cytometric analysis of endothelial PSF1 promoter activity in skin tissues around tumors 3 days after tumor cell inoculation. 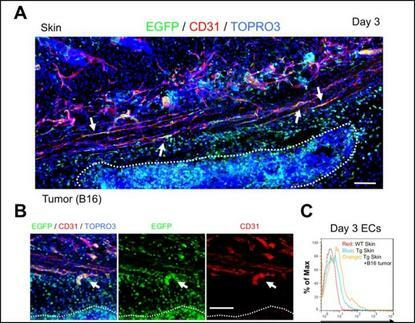 PSF1 promoter activity in ECs is increased in the skin vasculature, with B16 tumor inoculation (orange) relative to skin from wild type (WT; red) or transgenic (Tg; blue) mice in the steady state. Angiogenesis, the formation of new blood vessels, is essential for tumor growth. A new study describes a vascular stabilization biomarker that can visualize blood vessel activity, thus optimizing the timing of anticancer therapies including anti-angiogenics. Do some prescriptive sleeping pills posses a danger?